A hip fracture is a break in the femur (thigh bone). The is fracture is classified by the area on the femur that is fractured: femoral head, femoral neck, intertrochanteric and subtrochanteric areas can be fractured. Patients that are older or those with weakened bone (osteoporosis, osteopenia, tumors, etc.) are susceptible to fracture after trauma or falls. Patients with hip fractures have pain and loss of function, including the ability to walk. After a few days, swelling and bruising may extend down the entire leg. Patients will often experience clicking when they try to move their hip. Non-operative treatment for hip fractures is not recommended. Surgery may be delayed if other injuries or medical condition preclude the surgery at the time of injury. 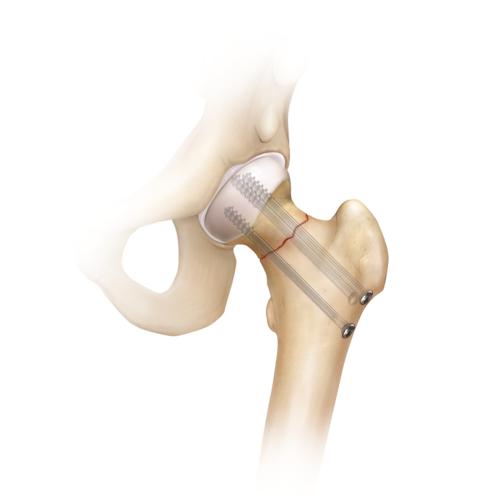 Hip fracture repair is dependent on the area of the hip that is fractured. Fracture repair may include using screws, a plate and screws, a rod that is inserted into the femur or a hip replacement. The type of surgery should be discussed with your surgeon. Postoperative medication to prevent blood clots and reduce pain may be prescribed by your surgeon. Activity modification and physical therapy is at your surgeon’s discretion.